The thyroid function test kit finds out whether your thyroid has normal, low, or high function. Low thyroid function can be treated with tablets which replace the thyroid hormones. High thyroid function can be treated by tablets, radiation, or surgery which aims to lower your thyroid function back to normal levels. At Superdrug Online Doctor, we offer a thyroid test kit to check what your levels of thyroid hormones are to see if you might need treatment. You can order a test kit if you’re over 18 years old. What are good thyroid hormone levels? What happens when thyroid levels are too low? What happens if thyroid levels are too high? How can you get a thyroid function blood test? What thyroid treatments are there? The thyroid is a small organ located at the front of the neck, just below the Adam’s apple. It’s made up of two halves, each about 4-6 centimetres in length. The two halves form an H-shape. You usually won't be able to feel the thyroid gland in your neck when it is a normal size. The thyroid gland releases hormones, which are chemical messengers. The hormones that the thyroid produces control your metabolism, which means that it regulates the speed at which your cells work. Around 1 in 100 people have low thyroid function and around 1 in 200 people have high thyroid function. Women are around ten times more likely to have high or low thyroid function compared to men. Low thyroid function is more common in older women. Even if you don’t experience these symptoms, having low thyroid function can put you at a higher risk of developing heart disease. Even if you don’t experience these symptoms, having high thyroid function can put you at a higher risk of developing heart disease and weak bones (osteoporosis). 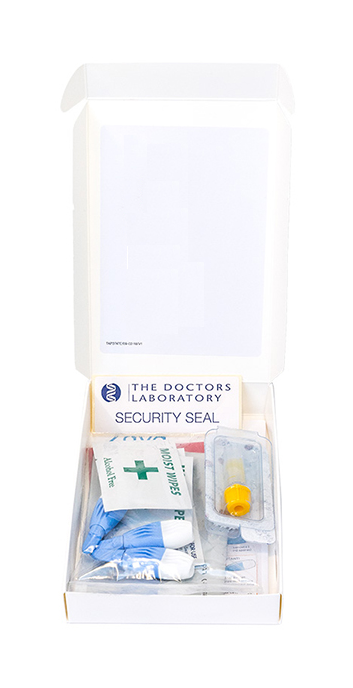 We offer a kit through our Superdrug Online Doctor service for you to test your thyroid levels. To order your test kit, simply fill in a short questionnaire. Your kit will be sent to you by post. You will receive the results of your thyroid blood test two to three days after the lab receives your your kit. A Superdrug doctor will send you advice based on your results. You can also get a thyroid blood test through your GP practice. Simply book a face-to-face appointment with your GP who will be able to speak to you about your concerns regarding your thyroid. It’s important to note that some GPs would choose not to do a thyroid blood test unless you are having symptoms of high or low thyroid function. If you have low thyroid function, you may need to take replacement thyroid hormones. These can come in the form of tablets called Levothyroxine.